Jared from Mattioni was very nice and professional and resolved our leak in the ceiling. The price seemed very reasonable to me. He also provided me a quote for a new hot/cold outdoor spigot while he was here. Paul Mento is the best. He is knowledgeable and performs his work with precision and accuracy. Paul has been working in my home for years and I can always count on top performance. He treats his customers like they were family. Over the years he has EARNED my trust. He is certainly an asset to the Mattioni "team". Thanks Paul Julie D.
Good work, repair techs showed up only a few hours after I called for service and completed major repairs in only a few hours. Everything was done by lunchtime. Good work, despite only a few hours notice they showed up right at the stated time, performed major repairs quickly and explained everything that they found and fixed along with the various options for repair/replacement. Carl was efficient, thorough and very courteous. After explaining the work that needed to be done, options were given without any pressure and the job completed in no time. He double checked everything and cleaned up after himself which is a rarity these days. I would absolutely recommend your company to anyone who needs a plumber. Carl D. Was a polite, conscious and thorough technician. Solved the problem and cleaned up afterwards. Highly recommend this company and this tech! Very knowledgeable and fantastic service. Rob and Tim were great. Will definitely be using them going forward! Knowledgeable and fantastic service. We will definitely use them again! We recently had an issue with our water softener. As luck would have it, it happened on a Sunday. Barbara responded to our call and dispatched Carl D. Carl was at our house shortly thereafter. Carl was extremely courteous, professional and efficient. Much appreciated! Carl was incredibly helpful and informative. Felt like he put the customer first and that was very much appreciated. Albeit only a scheduled maintenance appointment, my technician Dennis showed up both on time and cheerful in disposition. He readily addressed some questions I had re operation of our new thermostat, expanding even additional information which was most useful. System was checked in a through & timely manner, everything reviewed & now comfortably set until our next six month check up. Pleasure doing business with. Mike was very professional and completed the work in a timely and efficient manner. I will be happy to have him as my heating system tech. Jason kept me informed regarding the time of the appointment. Carl D did a great job! Lucas was outstanding, friendly, honest, and knows his craft. Thanks for all your help. Thank you Carl D., for your friendly and professional manner and by the way for repairing our home ot water heater. Jared C has a 5-Star rating and leads the company in total reviews, making this pro a ReviewBuzz Rockstar! 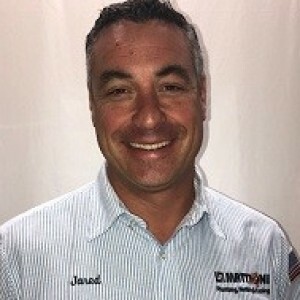 Jared hails from Downingtown, and comes to us with many years of Plumbing experience. He and his wife have 2 children and he enjoys family time and golf. We are very pleased with the work that Mattioni(Jared) performed. They are now our full time plumber! Jared did a great job. We are very pleased with the recommendations they made and the work they performed. We will definitely have them do more work in the future! Jared was very professional (as always). He is our "go to" plumber! Got the service I needed, quickly and with good explanation. Thorough, efficient, clear explanations. Thanks. Jared was a great resource for information, and worked quickly to do the updates that I needed. He was very good at explaining each part of the process, and of providing information for future improvements. Thank you, Jared. Jared was professional, clean and courteous. He showed me several options and payment plans to fit in my budget. 5 stars to customer service, dispatch and my new favorite technician! For nearly 20 years I have called on Mattioni Plumbing both commercially and for my home. They never disappoint. Today, Jared and Ben were at my home installing new treatment tanks for my well. It is a big job, and you would never even know they were here. Engaging, prompt, clean and efficient as always, I never question their work, because it always does! I had a new water heater and new water softener/purifier put in. The service and work performed could not have been any better. They were very professional, extremely courteous, and explained exactly everything that they were doing. I was shown, in detail, the results of my new water softener/purifier. There was a minor plumbing issue with my house and they took care of it immediately. The work was of high quality and the work areas were left very clean. I highly, highly recommend this company. Great service from Jared and Matt G.! Our house runs on well water. An hour before my son's high school graduation, our water suddenly stopped working. Mattioni offered emergency service and immediately sent Jared to our house to evaluate the situation. He determined that the problem was most likely our 13-year-old well pump. Jared returned the following day with Matt G. and they replaced our pump. The whole process was handled quickly and professionally, and we were without water for less than 24 hours. Jared came out to do our healthy home yearly inspection. He addressed my concerns and made recommendations. He was very knowledgeable, friendly and courteous. He was extremely neat and took care to not track dirt into the house. I would recommend Mattioni Plumbing, Heating and Cooling. Jared did a plumbing inspection for me yesterday. He was very personable, and answered all of my questions. I would recommend him to anyone who needed a good plumber. I like being given straight answers even if it is unpleasant news. The people there always try to do their best to find an answer to the problem and repair what needs to be repaired. We are very happy with the service and the people we deal with. I am always pleased with the work done by Mattioni. Jared and Derrik replaced my hot water heater and completed a full plumbing inspection, they were on time, professional, and seemed genuine. Excellent service. Jared C and Derrick identified the problem, reviewed options and than resolved the problem. Overall excellent! John and Jared were prompt, polite, efficient, and neat in appearance and work habits. They listened to my description of the problem, made their diagnostic evals, and presented me with options and prices. Their work was speedy. I was very satisfied and happy to have the situation taken care of so quickly. Jared and Derrick came to replace our pump last week and discovered more very serious problems. Jared proposed solutions and his recommendations were clear and understandable. He said it could be scheduled in a timely fashion. Derrick was very polite and helpful. It was his first time at our farm and I had a very good impression. I'm expecting them both back to complete the work they recommended. Jared did a superb job, was friendly & efficient. We mentioned a problem with mildew on our shower fawcett that was bothersome & ugly. He offered to recaulk the fawcett & even reinforced it. We were very pleased. I called Mattioni's on the recommendation from a relative. I had a leak in my pipe that lead from my well (or so I thought) and my water pressure was extremely low. Mattioni's was prompt with making an appt. for me. Jared C. was sent to my home to diagnose the problem. He found that my antiquated water softener system was not functioning properly. The system was old and needed to be replaced. Jared spent 3 hours explaining what would be done to replace the water softener. This included replacing the brine tank, neutralizer tank, well tank with bladder, and the softener tank....and of course, all the pipes, gauges, and accompanying tubing. I also signed on for a healthy home inspection. Jared inspected all the plumbing fixtures in the house and found that my ice maker tubing was in danger of crumbling. For $96, this healthy home inspection found another concern AND I received and will continue to receive, a 16% discount on any work that I will have completed in my home by Mattioni's for a year. I consented for Jared to replace my softener system and the ice maker tubing. Because of my work schedule, Mattioni's was able to order the system in a timely manner. Jared and his apprentice were able to install the system and fix my ice maker line all in one day. Jared and his apprentice were professional, proficient, neat, and installed a water softener that will give me many years of service. Thank you Jared for all that you did to explain and complete this job. I now have a new plumbing company, Mattioni's....AND a new plumber, Jared for all my future plumbing needs. Jared is a first class guy and an excellent plumber as was his helper. Excellent job!